I have often wondered how rich a company or person would have to be in order to not succumb to the pressure of licensing their movie/cartoon character/likeness to sell crappy food. Witness the recent marriage of the latest Stephen Spielberg and George Lucas creation Indiana Jones and the Kingdom of the Crystal Skull despite their combined personal net worth of $6.5 billion, to Burger King in the form of an Indy Whopper (two quarter-pound patties topped with two slices of melted pepper jack cheese, four slices of bacon, spicy Cajun mayo, tomatoes, lettuce and onions on a toasted sesame seed bun) and to Mars with their Snicker's Adventure Bar. Pediatrician Dr. Rahul Parikh took notice too, and in a bitingly funny, yet scathing open letter posted on Salon.com called on Lucas and Spielberg to stop allowing their characters to be licensed to junk. "In the 30 years since you've started making movies, one thing that hasn't changed is a kid's (or in my case, a grown man's) imagination and wonder. And who sparks that better than you? But a lot of other things about kids have changed. Their health is one of them. Today, almost one in four kids is obese, putting them at risk for, among other things, diabetes and cardiovascular disease. The epidemic of obesity is serious enough that we're predicting that this current generation won't live as long their parents and grandparents. That's incredible if you think about it. Which brings me to why I wrote this letter. I'm a pediatrician, and every day I see overweight kids coming into my office. Getting families and kids to change how they eat is an uphill battle, and it doesn't get easier when big studios like yours wheel and deal with companies that peddle junk food and fast food. Besides the fact that none of these foods is healthy, one has to ask if they're what your characters would eat. Would Lord Vader chug down a Pepsi before he wielded his light saber? (If he did, would he drink it with a straw or take off his entire mask?) 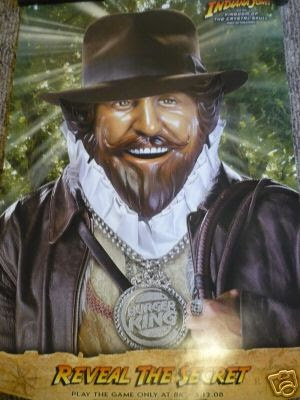 Wouldn't Indy, now a senior citizen, have more than just a little bump in his cholesterol if he had scarfed down his namesake burger with fries and a soda? How could he be fit enough to chase down ancient relics while dodging boulders and outwitting Nazis? So I'm asking you: Why do you still tie in your movies with junk food and fast food? I know that you and your corporate partners make millions from deals with conglomerate food companies and fast-food chains. But do you really need the extra cash at this point? Wouldn't it be better, in a corporate crusader kind of way, to change course? Stop these deals, or partner with somebody who thinks a little healthier? If not, then perhaps a little truth in advertising, or in cinema, is in order. You should show us how your characters would look if they ate the food that you helped peddle. In that vein, you got Jabba the Hutt right. But Princess Leia in her skimpy steel bikini with cellulite? Indiana Jones having to hit the brakes during a car chase and find a glass of water so he can take his Lipitor? Now that I think about it, wouldn't Viagra have been the best tie-in for the new movie?" Jeers to Lucas and Spielberg!